My goal from last year was to read 50 books from my home TBR stacks. I only actually read 40 from my TBR stacks but also had 19 rereads from my own shelves so I think this accomplishes the spirit of the thing -- which was to make use of the books I've already bought. I'm going to keep the same goal for this year and count rereads again too. I also wanted to read more non-fiction and translated/international fiction. I did well on the translated and international fiction but not so well on the non-fiction. I'll keep the same goal for this year and just try to read "more" of both. I planned to read lots of Gregory Maguire, Matthew Pearl and Charles Dickens. I totally bombed on all three -- reading only one Dickens (and part of a second) and one Pearl. I still have a couple of months left on the Dickens project though so maybe I can get a couple more reads in! I plan to continue with my Top 100 Chapter Books Read-Along Project at The Estella Society. I've finished eight books of the 100 so far and am really enjoying the project. I have a lot of great books on the list for this year too! I also want to make some progress on the 1001 Books To Read Before You Die list again. I'm now working from the app that lists all of the books from the various iterations of the list so it's actually 1294 books now. I don't plan on reading all of them ever but it reminds me of many books that I do want to read. I've read 104 of the books or 8% of the lists so far. Here are the twenty titles that I own right now (on LibraryThing). I'll try to read as many as possible. 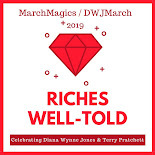 And it looks like there's enough interest in DWJ March again so I'll let you know about that soon (and be soliciting for some guest posts). Finally, I'll choose a few group reads to participate in (starting with Cheerful Weather for the Wedding this month with Simon) and I'll likely join in all of Carl's challenges this year -- The Science Fiction Experience, the Once Upon a Time event and the Readers Imbibing Peril (RIP) event. Look for my Sci-Fi launch post soon (I'm looking at Connie Willis and William Gibson to start)! How many books are you hoping to read in 2013? Any specific challenges or goals that you're looking forward to? I'm looking forward to your thoughts on Cheerful Weather! Here's to a Happy 2013! Those are some good goals and I think you did great reading from your shelves. I need to work on that. Happy New Year! I agree. I was very glad to read that many books from my shelves ... though I thought that I would have less left to read when I was done. I think a buy ban would help that but it'll never happen! Great goals! I have a similar goal when it comes to my tbr pile. I'm hoping to read some DWJ this year too! Happy New Year! Ha! I totally meant to re-read Wicked and finally finish off Maguire's Oz series ... except I didn't even pick up one of them! I'm thinking of doing this either this fall! I would be up for that! I was thinking about reading them in the Fall anyways, after I get settled from our move and the kids start school!